Prior to 1927, residents of the small hamlet of Greenlawn, New York, were supplied with water by a private company known as the Sanders Water Company. 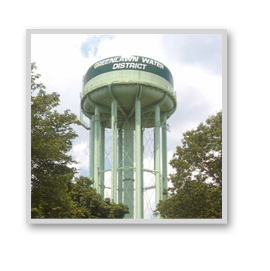 In July 1927, the Greenlawn Water District was established, and shortly afterward the District Commissioners purchased the Sanders Water Company’s facilities, and also property in the northern part of Greenlawn for a storage tank site. The first recorded Minutes of the Board of Commissioners are dated August 8, 1927, and its first officers were Elwood Powell, G. Fred Ellis, and Edward Smith. Isaac R. Swezey was engaged as Counsel and Harold C. Stevens as Engineer. As the population grew, communities surrounding the original boundaries were incorporated into the Greenlawn Water District. Today the District boundaries include thirteen square miles, bounded more or less on the north by Route 25A, on the east by Townline and Commack Roads, on the south by Jericho Turnpike, and by Cherry Lane and Lake Road to the west. As the Water District has grown, so of necessity have its facilities. The original standpipe of 360,000 gallon capacity, called “the water tower,” was dismantled and replaced by a 1,500,000 gallon capacity standpipe, and the “little well in the swamp” was to become the smallest of seventeen pumping stations. During the 1950s, two large storage tanks were built, one on Jericho Turnpike near Old Country Road, with a capacity of 500,000 gallons, and the other in Commack, on Larkfield Road, of 1,000,000 gallon size. A 3,000,000 gallon underground tank was added to the system in 1970 to afford the District even greater fire protection. Consumers of the Greenlawn Water District now number over 42,000 compared to the original 56 consumers served at the inception of the Water District in 1927. Cooperation with the six Fire Departments which share boundaries with the Water District (Greenlawn, Centerport, Commack, East Northport, Huntington Manor, and Dix Hills) in the rental and maintenance of approximately 1,300 fire hydrants is part of the District’s service to the community. The following are the ordinances, rules and regulations established pursuant to law by the Board of Water Commissioners of the Greenlawn Water District, Greenlawn, New York, and are part of the contract with each person or persons using water furnished by this District. The word “District” shall refer to the Greenlawn Water District, Town of Huntington, County of Suffolk, State of New York. The word “Board” or “Board of Commissioners” shall refer to the Board of Commissioners of the District. The word “owner” or “property owner” shall refer to an owner of real property serviced or to be serviced by the District. The word “water main” shall refer to the water mains in the distribution system of the District, which are generally located in the street or within an easement which transmit water to fire hydrants and to water service lines of owners. The words “water service” and “water service line” shall refer to the pipe running from the “corporation” stop, wet-cut in the District distribution main, running to the plumbing within an owner’s premises. All applications for the use of water or for the use of the water facilities of the District or for the introduction of water into any premises or for the extension of any pipe or main or connection to the District water mains shall be made in writing on forms provided by the District and submitted to the District at its office located at 45 Railroad Street, Greenlawn, New York 11740. The applicant shall, in every instance, be the owner of the property or the authorized agent of the owner of the property. Water shall not be used for any purpose other than that represented in the application. Upon acceptance by the Board of Commissioners of such application, the application shall constitute a contract between the applicant and the District, obligating the applicant to pay to the District the established rate or rates as the same shall from time to time be fixed by the Board of Commissioners, and shall constitute an agreement to comply with and be bound by the ordinances, rules and regulations of the Greenlawn Water District and amendments thereto. Such application shall also constitute a consent by the applicant and consumer for all commissioners, agents, officer or employees of the District to enter upon any property owned or leased by the applicant or consumer for the purposes of installing, inspecting, repairing or removing any or all meters, valves, pipes or other property of the District located thereon or for the purpose of examining, inspecting or testing the plumbing facilities on such property and the manner in which the water or services of the Water District are being used. The property owner shall pay the full cost of all materials and labor for the installation of service pipes, meters and appurtenances supplying water from the connection to the District water main to the owner’s property, and tapping and hookup fees as shall from time to time be fixed by the Board of Commissioners. To maintain uniformity and quality, all equipment, meters, and appurtenances thereto shall be purchased from the District or meet the specifications set forth by the Board of Commissioners. Initial installation of water service pipes and appurtenances between the water main and the owner’s property, and through and into the serviced premises (including the meter pit), is and shall be the responsibility of the property owner. Upon approval of proper installation, the District will be responsible for maintenance of the service lines from the water main to the owner’s property line. All maintenance, repairs and modifications to the water service pipes and appurtenances from owner’s property line and through and into the serviced premises (including the meter pit), is and shall be the responsibility of the property owner. In those instances in which a service line is tapped on a District easement, the property owner shall be responsible for maintenance of the service line up to the water main. Any and all such installations, maintenance, repair or modification work shall be performed only by bonded plumbers or pipe installation contractors, licensed by the Town of Huntington and engaged and paid for by the property owner. No such plumber or pipe installation contractor shall perform any of such work unless and until such plumber or contractor has filed with the District a performance bond in the sum established from time to time by the Board of Commissioners, valid for one (1) year period. A list of bonded plumbers and contractors is on file at the District office. Except as specifically provided herein, tapping of water mains for service connections or any other purpose shall be performed only by authorized employees of the District. Upon prior specific prior authorization by the District, a qualified contractor may be permitted to perform such work in those instances in which the connection exceeds two inches in diameter, provided such work shall in all respects comply with the specifications and requirements as may be established by the Board of Commissioners and by these ordinances, rules and regulations. No street, highway or public ground shall be opened or permitted to be opened by the property owner unless and until the property owner or the property owner’s licensed and authorized contractor shall have obtained, at the property owner’s expense, all permits required by the Town of Huntington, County of Suffolk, State of New York and any other governmental authorities having jurisdiction for street and highway openings, and any such work shall be performed only while such permits are in full force and effect. The consumer or applicant making such street or highway opening shall take all precautions for the safety and convenience of the public and shall assume all responsibility and liability for injury or damage resulting therefrom; and the property owner agrees to and shall save and hold the District, the Board of Commissioners, and their respective agents and employees harmless from and against all liability for injury or damage resulting from any such street or highway opening. All water service connections to the water mains of the District shall have installed therein a water meter to measure the consumption of water which meter meets the specifications set forth by the District. No meter may be removed from the service line without the prior approval of the District. The District may inspect and remove any meter for testing purposes, repair or replacement. The property owner shall in all instances be responsible for all costs and expenses of any original meter installation for any building, including the cost of such meter. Unless damaged by the property owner, the property owner’s tenants or invitees, replacement or repair of meters of one inch or less in residential premises will not be charged to the property owner. The property owner shall be responsible for all costs and expenses for replacement or repair of any meter in excess of one inch and any meter in any non-residential premises, in accordance with service line size. All water services shall be installed in accordance with specifications on file and obtainable at the District office, and shall be a minimum size of one inch Type K copper tube, with all fittings to comply with District standards. No coupling shall be used between the water main and the meter setting and no red lead or joint compound shall be used between the water main and the meter setting. All underground water services shall have a minimum three (3) foot separation from other underground utilities. Replacement of any existing service lines on an owner’s property shall conform in all respects to current District standards and specifications and with these ordinances, rules and regulations. The abandonment of an existing water service shall be performed at the owner’s expense by a contractor bonded with the District and licensed with Town of Huntington as provided in Section V, paragraph 4 of these ordinances, rules and regulations. All fire lines shall be equipped with a double check valve assembly and a gate valve with an outside stem and yoke which comply in all respects with New York State law, the rules and regulations set forth and promulgated by the New York State Department of Health, and the Town Code of the Town of Huntington. Property owners are responsible for obtaining any permits for the installation and maintenance of such systems which may be required by the Town of Huntington and any other governmental authority having jurisdiction over the subject premises. The property owner shall, at the property owner’s expense, maintain all service lines, water pipes and fixtures within the owner’s property boundaries in good repair and protected from freezing. The property owner shall keep the curb box and meter pit cover clear of obstructions and foliage, at ground level, and in workable condition at all times. In the event that any residence or other building is to be vacated, the property owner shall notify the District in order that the meter may be read and the curb stop closed. Additionally the property owner shall have the water shut off by a licensed plumber when the premises become vacant. In case of failure to do so resulting in bursting pipes, the property owner shall pay for all water lost, the quantity to be estimated by the District and added to the next bill and paid in like manner as the regular water charges. In no event shall the District be liable for any structural damage, damage to contents, or any other damages resulting from any burst pipes within any building, whether residential, commercial or otherwise. Interconnections or cross connections, or any other means by which water from sources other than from the District’s wells may be introduced into the District’s water mains, are strictly prohibited. No swimming pool connections, underground lawn or irrigation sprinkler systems shall be permitted unless equipped with a backflow device which complies in all respects with New York State law, the rules and regulations set forth and promulgated by the New York State Department of Health, and the Town Code of the Town of Huntington. Property owners are responsible for obtaining any permits for the installation and maintenance of such systems which may be required by the Town of Huntington and any other governmental authority having jurisdiction over the subject premises. All underground lawn sprinkler systems installed after July 1, 1989 shall be equipped with a weather/water sensor device that measures the moisture of the soil or soil density to prevent unnecessary watering of lawns and shrubs in rainy weather. All commercial and industrial premises shall be equipped with a reduced pressure zone device (“RPZ”) which complies in all respects with New York State law, the rules and regulations set forth and promulgated by the New York State Department of Health, and the Town Code of the Town of Huntington. All RPZs shall be inspected and tested annually by a certified New York State Department of Health backflow device tester contracted by the property owner, at the expense of the property owner. Test reports shall be forwarded to the District office. Failure to comply with the foregoing requirements will result in the termination of water supply by the District. Property owners are responsible for obtaining any permits for the installation and maintenance of such systems which may be required by the Town of Huntington and any other governmental authority having jurisdiction over the subject premises. District personnel shall be authorized to enter upon any premises during reasonable hours for the purpose of inspecting the premises to assess compliance with paragraphs 1, 2, 3 and 4 of this Section XIV in accordance with New York State Department of Health rules and regulations. No person shall open, damage, tamper with, cause to be obstructed or use for any purpose other than fire fighting any fire hydrant without the prior consent and approval of the Board of Commissioners; provided, however that a Chief of the Fire Department in the appropriate fire district or the authorized assistants thereof may open or direct the opening of any fire hydrant in the event of a fire or a fire drill or other Fire Department purposes. The Fire Department shall promptly notify the District whenever a fire hydrant has been used. No air-conditioning or refrigeration equipment shall be installed or maintained unless such equipment provides for the re-circulation of the condenser cooling water. Except as otherwise provided in this Section, a water service will not be turned on or off by the District unless the property owner, lessee or other authorized person has submitted to the District written authorization therefor. A service charge for each service call to turn the water service on or off shall be imposed, in the amount that shall from time to time be fixed by the Board of Commissioners, whether such service call is requested by the property owner, lessee or other authorized person or performed by the District independently pursuant to these ordinances, rules and regulations. In the event that a service installation has been made in any manner other than that authorized by the Board of Commissioners or these ordinances, rules and regulations. All water charges shall be the responsibility of the property owner and shall be billed directly to the property owner and not to a tenant. All water charges in arrears as of September 15 of each year shall be transferred to the property owner’s real property tax bill. Any unpaid water charges placed on the real property tax bill shall be subject to a ten percent (10%) penalty charge on the amount due. The property owner is and shall be responsible for all water charges for the property owner, any tenants and any other users of water at such premises. In all cases in which property is conveyed or transferred, the new owner is and shall be responsible for any and all unpaid water charges of the former owner. When property is conveyed, notice of such conveyance, with the name and forwarding address of the party from whom the property is conveyed, must be promptly provided in writing to the District so that the change in ownership may be noted in the District’s records and a final bill rendered. Nothing in this Paragraph 3 of this Section XIX shall be deemed to supersede the provisions of Paragraph 2 of this Section XIX. No application for the use or installation of water or the facilities of the District will be approved nor will any permit or license be granted, nor will any contract or agreement be entered into with any person, until all charges or arrearages due from such person, or relating to the subject property, shall have been paid. The Board of Commissioners may establish water rates, fees, and other charges from time to time pursuant to the authority granted under the Town Law of the State of New York. A listing of such water rates, fees and other charges as in effect will be posted at the District office and are available upon request. The Board of Commissioners may establish rental rates for fire hydrants used by Fire Districts by contract with the Fire Districts. The Board of Commissioners may establish charges for hydrant use by licensed contractors. The resale of District water under any conditions or circumstances is prohibited. In accordance with Section 145.15 of the Penal Law of the State of New York, a person is guilty of criminal tampering when, having no right to do so nor any reasonable ground to believe that he has such right, he tampers with, or makes connection to, property of a water district. Criminal tampering in the first degree is a Class A misdemeanor. In accordance with Section 145.20 of the Penal Law of the State of New York, a person is guilty of criminal tampering when, with intent to cause a substantial interruption or impairment of a service rendered to the public, and having no right to do so nor any reasonable ground to believe that he has such right, he damages or tampers with property of a water district. Criminal tampering in the first degree is a Class D felony. In accordance with Section 165.15 of the Penal Law of the State of New York, a person is guilty of theft of services when, with intent to avoid payment by himself or another person of the lawful charge for any service with is provided for a charge by a water district, he obtains or attempts to obtain such service for himself or another person or avoids or attempts to avoid payment therefor by himself or another person by means of tampering or making connection with the equipment of a water district. Generally, theft of services is a Class A misdemeanor. The Board of Water Commissioners reserves the right to change or amend these ordinances, rules and regulations, to make special rates or contracts in all proper cases, and to shut off the water supply without notice, in case of extensions, repairs, or other necessities, without liability for damages for lack of water, or for any other damage that may result from the shutting off of the water supply. All ordinances, rules and regulations heretofore enacted by the Board of Commissioners are hereby repealed insofar as they shall be inconsistent with any of the foregoing ordinances, rules and regulations, except that such repeal, or the express repeal of any ordinances, rules and regulations herein, shall not affect or prevent the prosecution or punishment of any person for any act done or committed in violation of such ordinances, rules and regulations prior to the effective date of these ordinances, rules and regulations. 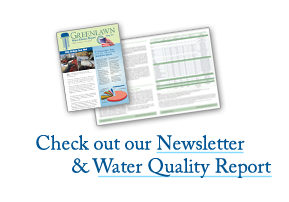 The foregoing ordinances, rules and regulations of the Greenlawn Water District duly adopted by the Board of Water Commissioners of the Greenlawn Water District on September 21, 2011, are effective and in force on October 9, 2011.